Here is another great recipe that can be prepared ahead of time and dumped in the crockpot for a fast easy meal. Double it and make 2 meals out of it! Great short cut for a busy week! Put all ingredients in the crock pot on low for 8-10 hours or high for 4-6. 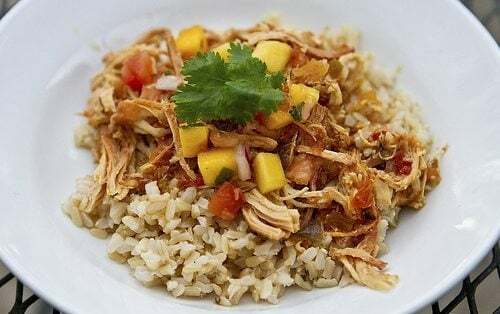 Shred chicken and use in tacos, burritos, enchiladas, nachos, etc. Make a double batch and freeze half for another night, or serve over rice for a second meal later in the week. Who’s mango salsa do u suggest? I have never seen any?